Playskool will "roll out" their newest Transformers Rescue Bots offering for kids 3-7 years old in time for the holiday season this fall. This cute a simple Transformer line is great for kids who want to see their physical Transformer figures transport “into” a video game on your television via the beam box. You just plug the game into your TV and place a Transformers Rescue Bot figure inside the Beam Box, see the pack light up and hear the signature character voice say a line like “reporting for duty!” Slide the beam box door shut and the figure is “transported” into the game on the TV, and magically hidden from sight within the beam box capsule. The Rescue Bots character can play the video game in either robot or vehicle mode. 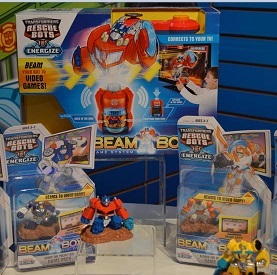 The Transformers Rescue Bots Beam Box game system by Playskool is aimed at children ages 3-7 years old, and will retail for $49.99 when it becomes available Fall 2013. The Beam Box will come with an included Optimus Prime figure, with additional figures sold separately. To expand the rescue mini-mission play in the video game, Transformers Rescue Bots Beam Box Game Pack assortment will retail for $6.99 this fall. You can choose from five additional players with new gameplay and powers: Bumblebee, Chase the Police-Bot, HeatWave the Fire-Bot, Blades the Copter-Bot and Boulder the Construction-Bot. My son loves this game and the search has been on for all the little figures for this game. We have been able to locate all but the Chase figure. Any way to get Chase? Is it even out yet? I can find sold out site from Canada, but none in US. Thanks for any info. It’s not available anywhere, even from the Canadian Walmart (says out of stock), and not listed on the Playskool site. For whatever reason, it appears never to have been released.